Photos courtesy of M. Scott Moon/Kenaitzie Indian Tribe. Deb Nyquist, wellness director at the Dena’ina Wellness Center in Kenai, and Fridrick Gudmundsson, youth services clinician, talk about the Nolan the Colon display at the center March 9. Let’s just get the puns out of the way: The Southcentral Foundation and Dena’ina Health Center wasted no time eliminating misinformation about colorectal cancer on March 9, leaving curious visitors flush with information to digest. OK, enough with the crappy jokes. But when you’re traveling with a giant inflatable colon, a silly sense of humor is required. “Oh yeah, you have to. For the most part people laugh. First, they don’t know what it is. If they have kids it’s like, ‘Oh, a bouncy house.’ And then they come over and they’re like, ‘Oh,’” said Cherise Cummings, health educator with the Southcental Foundation. Cummings brought the unusual teaching tool to the Kenaitze Tribe’s Kenai health facility March 9, as March is Colorectal Cancer Awareness Month. 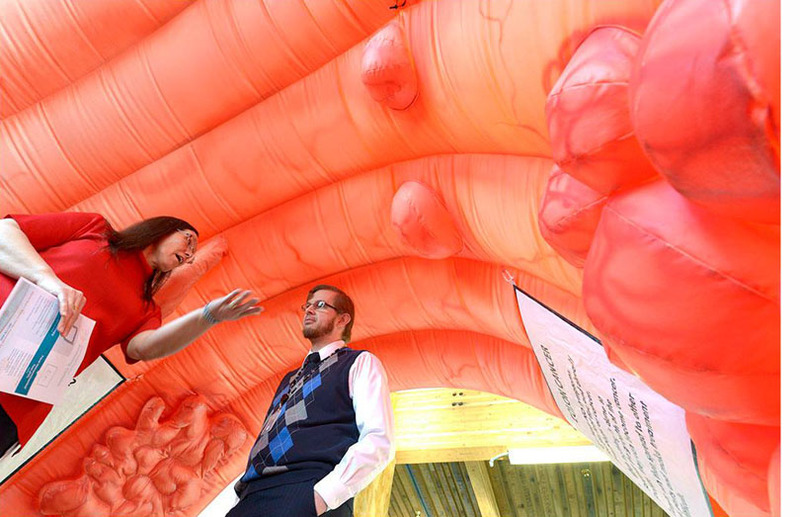 The 12-foot, inflatable, anatomical replica illustrates a healthy colon and the development of colorectal cancer, and gives information on how to prevent the disease. The pinkish, tunnel-shaped novelty comes complete with polyps, and a name. “This is Nolan the Colon and it’s just a great visual to get people to open up and talk about getting screened for colon cancer,” Cummings said. Nolan gets a workout during the winter, with health educators taking him on the road to communities served by the Southcentral Foundation, an Alaska Native health care organization established by Cook Inlet Region, Inc. He also makes appearances at various high-profile community events in Anchorage, along with Cummings and her associates dressed in bulbous, red, Nolan-related costumes. Colon cancer is the second deadliest cancer among Native men and women. As such, the recommended age for screening was lowered by a decade a year ago to age 40. It’s 45 for African-American men, and 50 for everyone else. Screening options include a colonoscopy — recommended every 10 years, or a yearly test of a stool sample. People in rural communities are particularly at risk. 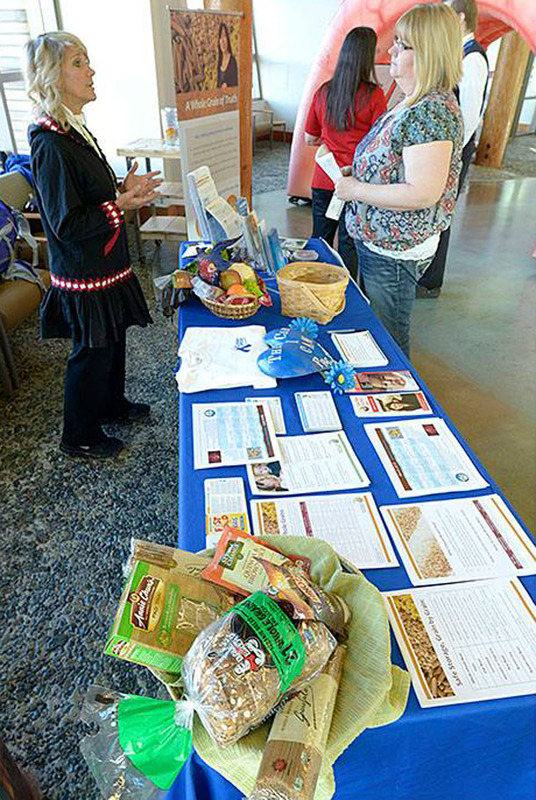 Cherise Cummings, a health educator from Southcentral Foundation, talks to Holly Wrate, medical office coordinator from the Dena’ina Wellness Center, about how a good diet helps prevent colorectal cancer. “It has to do with lifestyle choices, dietary choices. In the villages they have not as many a choices. So a lot of prepackaged food, processed food,” Cummings said. Soda, alcohol and cigarettes also contribute to the risk of developing colon cancer. Following a healthy lifestyle helps mitigate the risk, as Cummings playfully communicates. That’s right, a booty bump. From a colon polyp. Cummings has a softer approach, too. Health educators bring blue beads — blue being the color for colorectal cancer — and crafts with visitors, beading earrings and zipper pulls while chatting about family cancer history, lifestyle choices, warning signs and options for testing. “The Alaska Natives are very open to share stories, that’s how they want to know you. And so then they share their stories, and that’s when we get an educational opportunity,” Cummings said. Deb Nyquist, wellness director for the Dena’ina Wellness Center, said that Nolan was invited to Kenai to be one in a series of monthly health promotion activities at the center. “That isn’t something we have in our storage closet. And this makes it a fun, exciting, high-profile type of event, and helps people get more comfortable talking about it, to come over and walk through the colon and learn more information about why they should get colorectal cancer screening,” Nyquist said. Next month’s topic will be alcohol awareness. Information on health programs can be found by following the tribe’s Facebook page. “Our health promotion activities in the Gathering Space are open to the public. We want to provide this information to as many people as possible, because it’s important. Of course, our customers that come to the facility are here getting that information, as well,” Nyquist said. Nolan has been particularly noteworthy. “This one in particular has been exciting because of course we have this giant, inflatable colon in the Gathering Space, and that’s sort of intriguing and interesting. And the children that have come through with their families have used the little polyps inside there to punch them like punching bags, so it has been a lot of fun,” she said. All right, one more pun: And how did things come out from Nolan? Clarification —African Americans are screened at age 45.